In the true spirit of Mundane Travel, last week I headed out to Twinsburg Ohio for the week to do three audits; out on Monday and back on Friday. All three clients were a stones throw from each other, with two of them literally being across the street from each other. For a variety of reasons, I decided to drive out from Syracuse instead of fly. The drive in each direction just touches five hours, but in the grand scheme comparing it to flying, with airport security, layovers between flights, picking up and dropping off the rental car, it’s generally a wash between driving and flying, and as a bonus, I didn’t have to fit the trip around an airline schedule. Not much to note here; I just stopped at the airport to park my personal car and pick-up my rental; no airline check-in or trip through security. I arrived to the airport about 4:00 pm Monday afternoon (running very late), and the parking garage was packed. The sign at the garage entrance indicated that the first and second floors were full, and it turned out that the third floor was full too. That was likely due to winter storm Orson, which had just dumped about 8 inches of snow on Central NY (and a whole lot more snow North of Syracuse); no one wants to come back from their trip and have to dig their car out of a snow drift in the open lot. Without a single open space open on the first three floors, I ended up on the upper parking deck, which pretty much defeated the whole idea of paying extra to park in the garage. National is my employers “preferred” vendor for rental cars, and I rent cars from the Syracuse location so often I’m on a first name basis with the counter agents…they barely glance at my ID these days before they hand me the keys. The rental car lot for all of the rental agencies is on the first floor of the parking garage, less than a minute walk from the rental desks. Due to the small size of the airport, there is no Emerald Isle or other “bypass the counter” options; Everyone needs to pick their keys up from the respective rental agency counter although National does have a line for Emerald Isle members. For this trip the rental agent handed me the keys to a 2017 Buick Encore. This was my first time driving an Encore, which is Buick’s take on the compact SUV. I found it to be comfortable for the long ride, and was pleasantly surprised with an average of a little more than 30 MPG over the course of the trip. 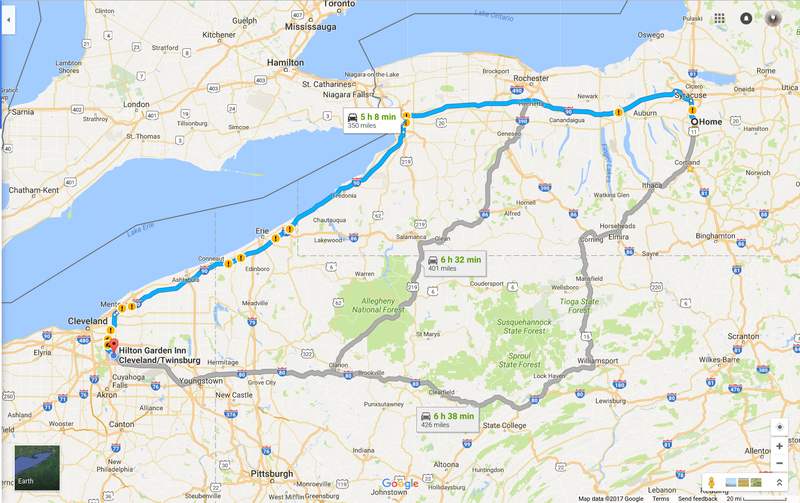 After picking-up my rental car, I made the 5 hour drive from Syracuse NY to Twinsburg Ohio. The majority of the drive to/from Ohio was via Interstate 90. For the drive out on Monday, other than the stretch between Syracuse and Rochester where the remnants of the snow storm was still being cleaned-up, the rest of the drive was on clear dry roads. The drive back to Syracuse on Friday was about as nice as it gets for February; clear weather, blue sky’s and dry roads. Other than some slow moving traffic through a few construction zones along Route 271 in Ohio, roads were clear and quick. If you happen to be driving along the New York State thruway between Buffalo and Erie and need some fuel or a nature break, you could do worse than to make a pit stop at the Angola Travel Plaza. It’s unique in a variety of ways, primarily in that it sits between the East and West bound lanes of Route 81 with an enclosed pedestrian bridge over the highway. Compared to other rest stops, it has a surprising variety of food with a McDonald’s, LavAzza, Sandella’s, Ella’s Pizza, Subway, Moe’s Southwest Grill, Auntie Anne’s, Carvel and Cinnabon. The player piano and clean bathrooms are a nice touch. NYS Thruway – Angola travel plaza – pedestrian bridge. For most trips I’m usually only in one spot for a day or two, but for this jaunt to Ohio, I was able to spend four nights in the same hotel; It was almost like camping! This was a pretty typical Hilton Garden with both some pluses and minuses (see below). The hotel sits at the end of a cul-de-sac with a few restaurants; a Wendy’s and a Cracker Barrel, along with a couple of restaurants that were closed and boarded-up. I had room 201 at the end of the hall with two queen beds. The room was clean and came with a microwave/refrigerator cabinet and a single serve coffee K-130 Kerug coffee maker. The view left a little to be desired as my window lookout out on the parking lot behind the building through a variety of trees and shrubbery. You may want to request a room at the front of the building or above the 2nd floor. There were plenty of electrical and USB outlets in the room, both on the nightstand between the beds and above the desk. Each room has both an RJ45 jack for wired internet access (bring your own cord) and wireless available throughout the hotel. Whenever wired is available, that’s what I use for both speed and security reasons. As with other Hilton properties, you need to sign-in on your browser to enable internet access. Basic internet access is complementary, with higher data rates are available for an additional daily charge. Work desk with outlets and wired Ethernet connection. Always leave house keeping a tip. I particularly liked the bathroom. The hotel went with minimalist fixtures, but what I really liked was their towel storage. I’ve never been a fan of a towel shelf mounted above the bathtub, as the towels almost always end up wet. This bathroom had wall mounted storage bins for all of the bathroom towels and supplies….definitely a good idea. The hotel dining area is open for breakfast from 6:00 to 10:00 am Monday through Friday, and 7:00 to 11:00 am Saturday and Sunday. Buffet w/ fruit, yogurt, potatoes, scrambled eggs and a variety of breads (toast/bagels, etc). You can also order omlets, pancakes, waffles, french toast, etc. The “bar” is open from 5:00 to 10:00 pm Monday through Saturday. I put bar in quotations as this property really doesn’t have a bar. The dining area is open in the evenings, and they will serve you beer or wine, but there is no bar in the traditional sense. Note that this hotel does not serve dinner in the evenings. The Blue Canyon restaurant is right next door to the hotel, and you can order room service from them. There’s also a Wendy’s and Cracker Barrel just up the street. The dining area mixes 2 and 4 seat tables, along with a long community table. Hilton Garden Inn Cleveland/Twinsburg – restaurant menu. Hilton Garden Inn Cleveland/Twinsburg – restaurant. The business center was well appointed with all of the basics and is open 24 hours a day. My favorite is that it has a high speed scanner, which is great because I always have lots of documentation to scan at the end of my audits. Bring your own USB stick to save your data. Hilton Garden Inn Cleveland/Twinsburg – business center. The hotel fitness center is open 6:00 am to 10:00 pm and is located immediately adjacent to the pool. It’s a bit cramped with two treadmills, an elliptical, weight bench, a rack of dumb bells and medicine balls. I was happy to see that they didn’t waste any space on a stationary recumbent bike, which in my opinion is one of the most useless pieces of exercise equipment ever invested. Hilton Garden Inn Cleveland/Twinsburg – fitness room.